First ‘double header’ of the winter last weekend. 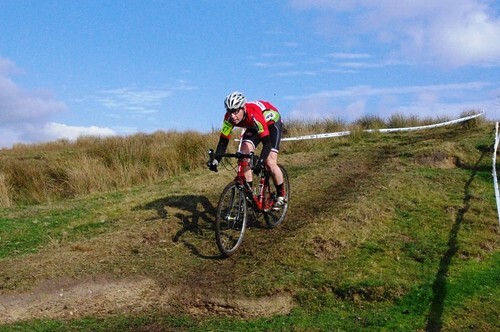 A hill climb and another round of the North West cyclocross league. Being on top form for both can be tough – recovering from one in time for the other is pretty tricky (as I found out last year when I decided to race cyclocross the day before the National Hill Climb Championships, a decision that came back to bite me approximately halfway up the hill when I went ‘pop’, deployed first gear nd grovelled to the finish line while wobbling all over the road). Obviously it wasn’t as easy as that. 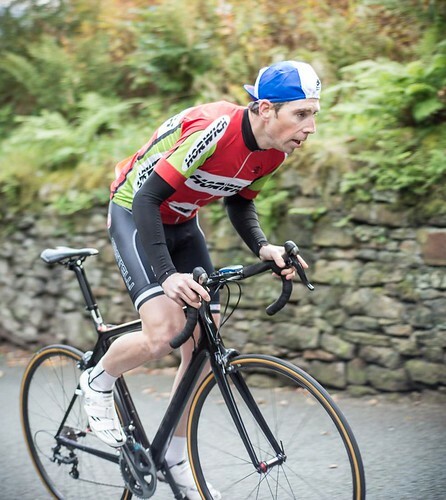 The hill climb went ‘OK’. I got what I’d deem an ‘acceptable’ time up the hill, too much worrying about blowing up before the final steep section meant I went conservative and got to the foot of the Rake itself far too fresh. 2mins 49secs wasn’t awful, but I know where a good few seconds were lost. Oh well. The noise from everyone cheering on the steeper slopes was ace though. A great atmosphere and a scarily knowledgeable guy on the PA, giving everyone loads of information about every rider made it a great event to take part in, and hang around for a bit afterwards to take my turn cheering/heckling. Hanging round after my run to cheer other riders on, natter to friends and generally faff about meant that the trip from one race to the other turned into a bit of a rush. One bike was flung in the back of the van, some ‘Sunday afternoon traffic’ was sworn at and, after driving about half a mile past where the race was trying to find somewhere to park, another bike was yanked off the bike rack in a semi panic as I realised sign on would close at almost exactly the same time I’d get to it. A fresh pair of shoes (and socks, ahem) were jammed on and I sprinted off down the road leaving Angela to sort everything else out and make her own way up to the race site. I managed to throw some money at the guys running the sign on tent and wave my race license just as one of the organisers announced they were closing and, with no knowledge of where the course went beyond what Joe and Andy had told me as I lined up at the start, the second race of the day kicked off. For the first couple of laps I rode conservatively (relatively speaking, I was still gasping for breath! ), trying to work out what was coming next by watching the behaviour of those just in front of me. Although not fast, I got round the first two laps without crashing and, once I had an idea of what was coming round each bend, started to work my way back up through the field. At the start of lap 2 I was sat in 24th place and by the bell lap I’d ridden back up to 10th. Much like the hill climb, it wasn’t an awful result, but certainly not ‘all that could have been’. Oh well. For the second time in a day it had been great to take part in, a very different course to most, and entertaining as a result. Another double header this weekend, this time with only one event each day thankfully, more ‘cross on Saturday followed by another hill climb up the Nick o; Pendle on the Sunday. Hopefully there’ll be less rushing involved! Nice. Life wouldn’t be the same if we weren’t all rushing around like loonies.